Merry Christmas! 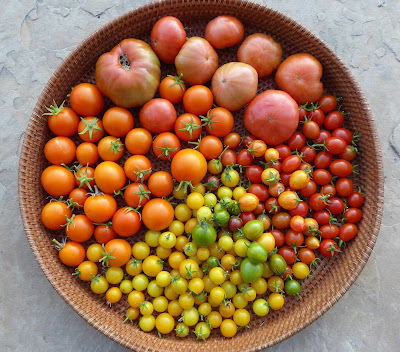 Tis the season to be picking peppers and tomatoes and squash? Depends on where you live but it's not typical here so this is an atypical Christmas Harvest post for me. Baccatum peppers are actually not all that unusual a harvest in December for me because they are fairly cold tolerant and they ripen late but I don't typically have this much to harvest. 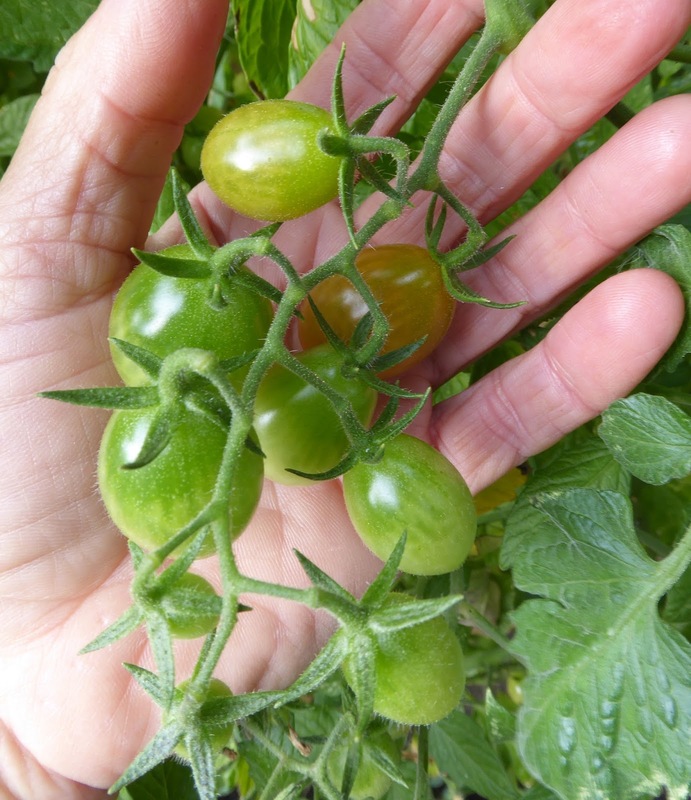 But vine ripened tomatoes are an unusual treat for late December. Those half ripe larger tomatoes finished ripening quickly on the kitchen counter and are surprisingly sweet and flavorful or perhaps I just have lower expectations for December tomatoes. The Jaune Flamme tomatoes have been a real treat, there's really no compromise in their flavor. 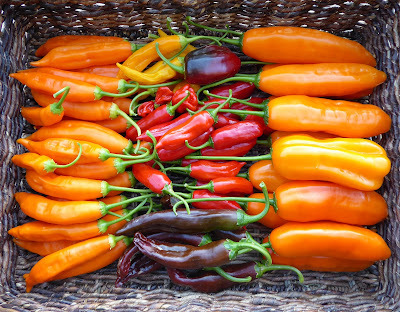 I cleaned out all the sweet peppers that I could find and they are also ripening on the kitchen counter. Most of those are also good eating when green, far better than a horrid green bell pepper. The orange Habanadas were prolific enough to fill another quart jar for another batch of dried fermented pepper flakes. A freeze warning prompted me to collect all the tender Tromba D'Albenga vine tips and squash of nearly any size that I could find. Most of those vine tips and half of that big squash below went into a pot of soup. 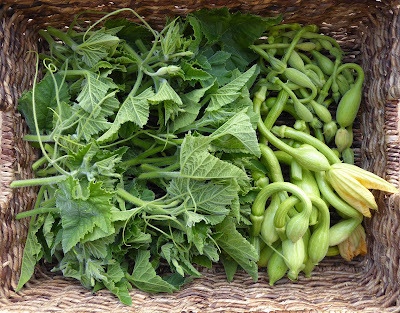 The vine tips are really good in soup, they lose the fuzzy texture and have a delicate squash flavor. 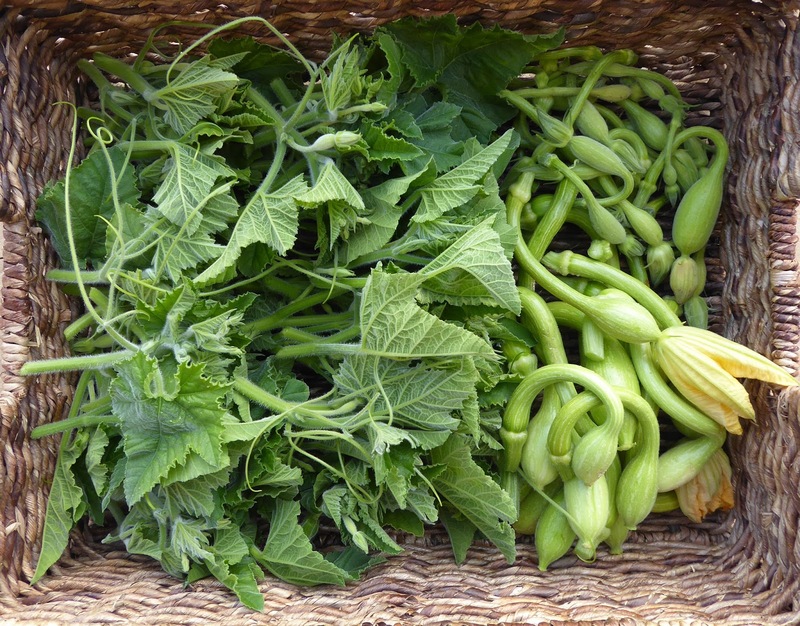 I was reading somewhere online that in some parts of Mexico they sell the vine soup ingredients together in a bag which includes the shoots, squash, and squash blossoms. I'll remember that for next year. My version of the soup was not traditional, I added some brown rice, shredded chicken, and tomato puree. A big pinch of fermented pepper flakes added some zing. Here's the most wintry harvest I could manage last week, some thinnings from my winter radishes. 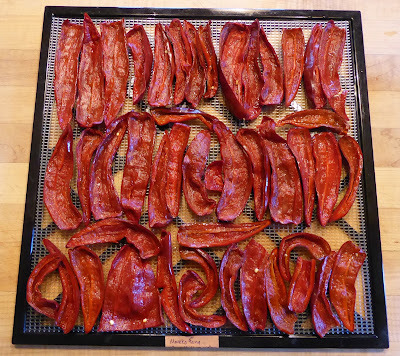 I like to ferment the tops and then dehydrate them. The chopped dried fermented greens add flavor to soups, stews, and sautes. 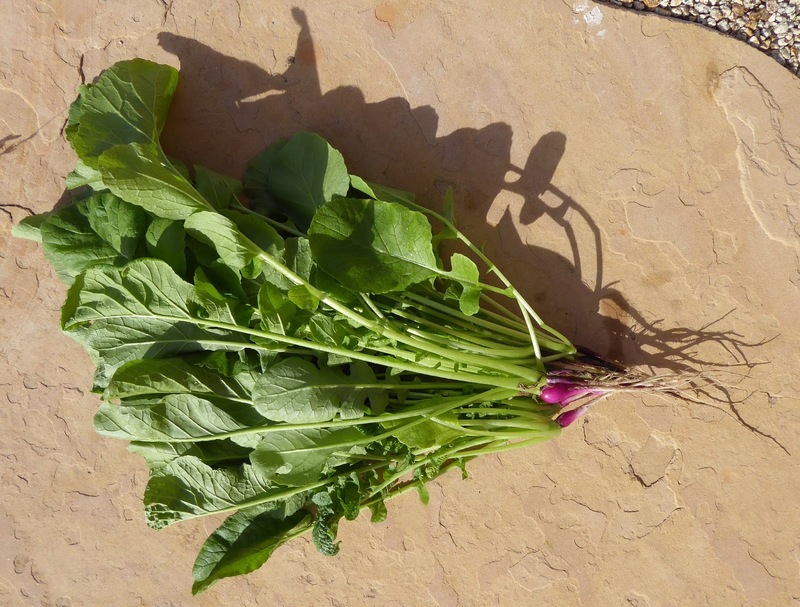 That last harvest of radish tops pushed my total harvests for 2017 to within a hair's breadth of the half ton mark so next week I get to brag a bit about my annual harvest total. 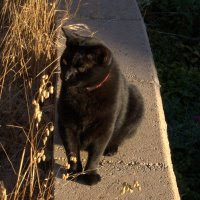 Oh, and if you are looking to link up to Harvest Monday next week come on over here, I'll be giving Dave a break and hosting for the month of January. 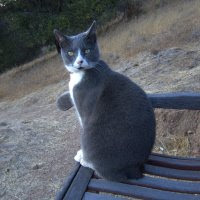 As you can tell from the title it has taken me a while to finish writing up this post. I took all the photos last week and uploaded them and then didn't get around to the narrative. So here goes, just a week late and a change of seasons but not much has changed. Looking down on Beds No. 1 and No. 4 it's looking a bit tatty. 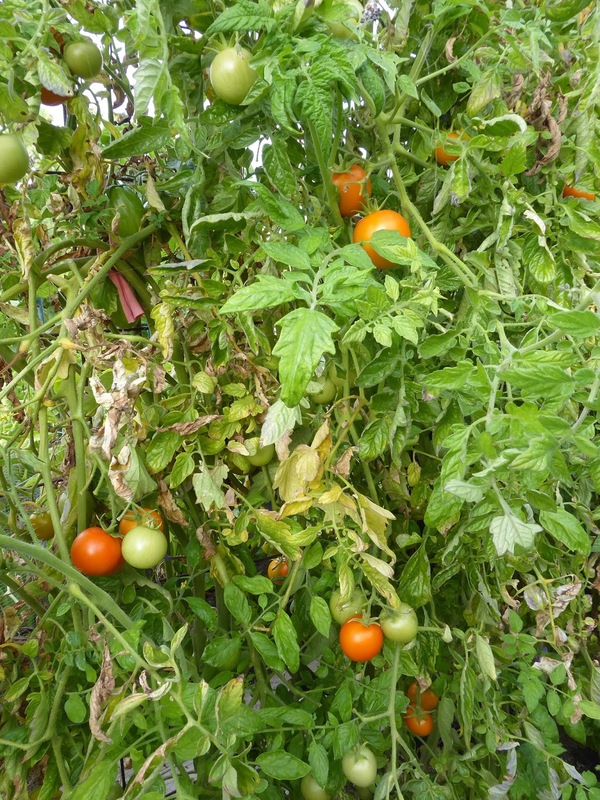 The tomato vines in Bed No. 1 are a mix of old brown foliage and new green. Beyond in Bed No. 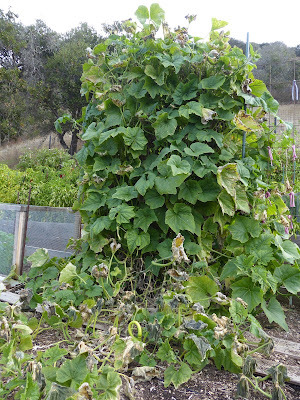 4 you can see the lingering Tromba D'Albenga vines and get a glimpse of an empty corner of the bed where I spread out the dead winter squash vines and then covered it all up with cardboard. Looking down on Beds No. 2 and No. 3 there's a bunch of caged in areas where I've got veggies growing that are likely targets of birds, rats, mice, and voles. It's a mix of fall and winter producing veggies and overwintering veggies that hopefully will survive into spring and give me some early harvests. Here's a look at Bed No. 1 from the other side. 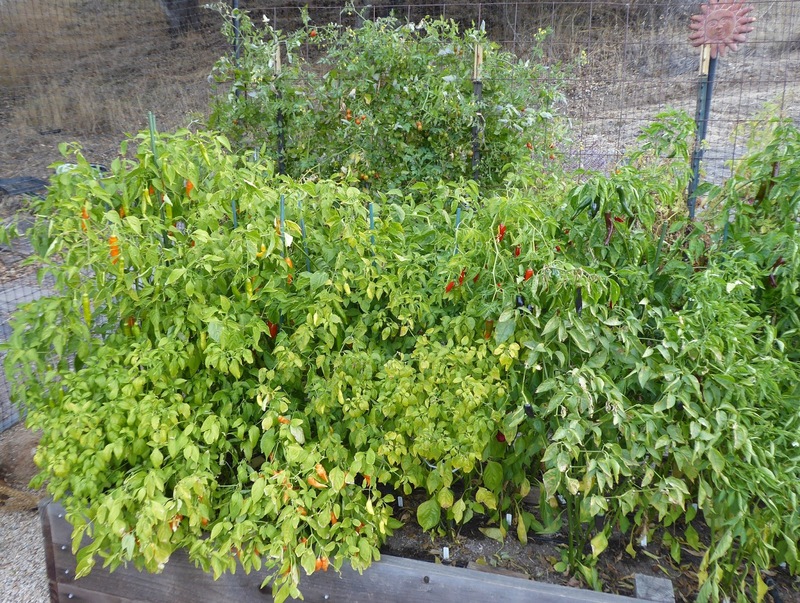 All the pepper plants are still left but most of them are done producing. I'll pull out the tomato and pepper plants when the tomatoes are either killed off by a freeze or the start of the new year, whichever comes first. I've been trying to get some chickpea plants started to take the place of some of the pepper plants but have had very poor germination so I'll have to sow a cover crop instead. 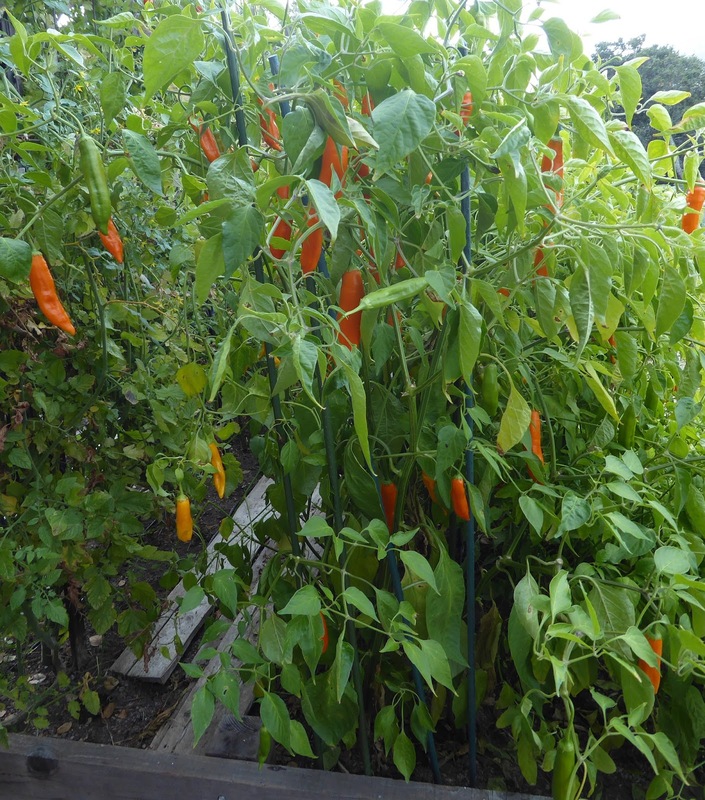 The seasoning peppers at the other end of the bed are still giving me a lot of ripe peppers. 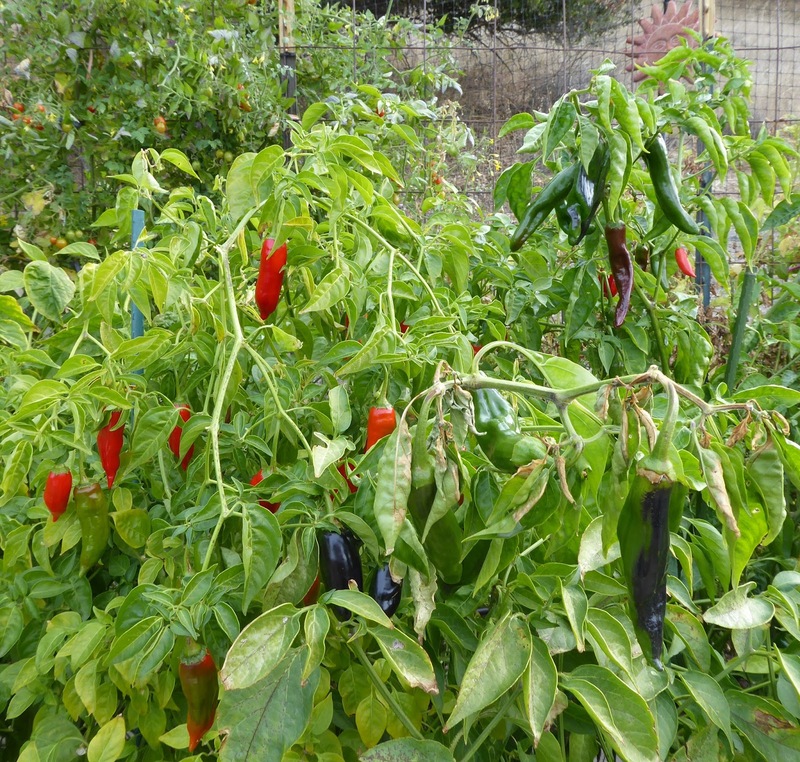 You can see some of the colorful peppers peeking out of the foliage. A closer look reveals green peppers also. 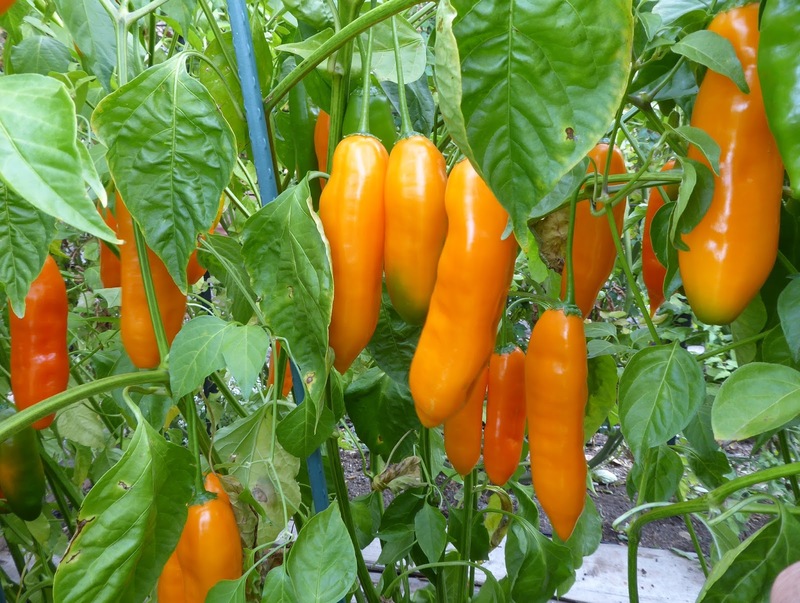 The real action is on the Aji Amarillo plants. 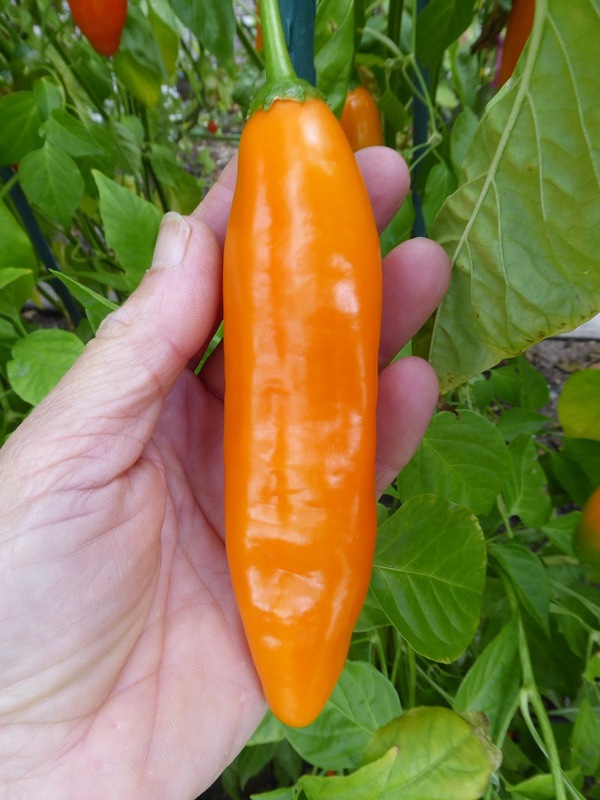 Joe's Giant Aji Amarillo is really impressive with large thick fleshed beautiful peppers that have a lovely fruity flavor and intense aroma. Their only downside is that they ripen rather late. 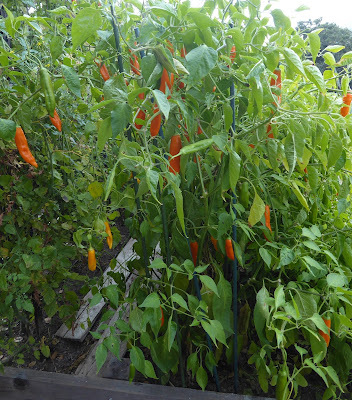 The Habanada plants have been quite prolific. Their harvests have lasted quite a while. It's a beautiful pepper, sweet, absolutely no heat, thin fleshed and crisp. 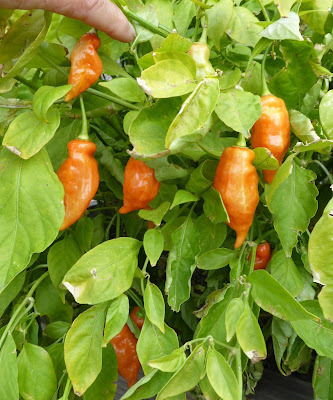 They do have the characteristic Habanero aroma but it's not very intense and overall I found them to be kinda bland. 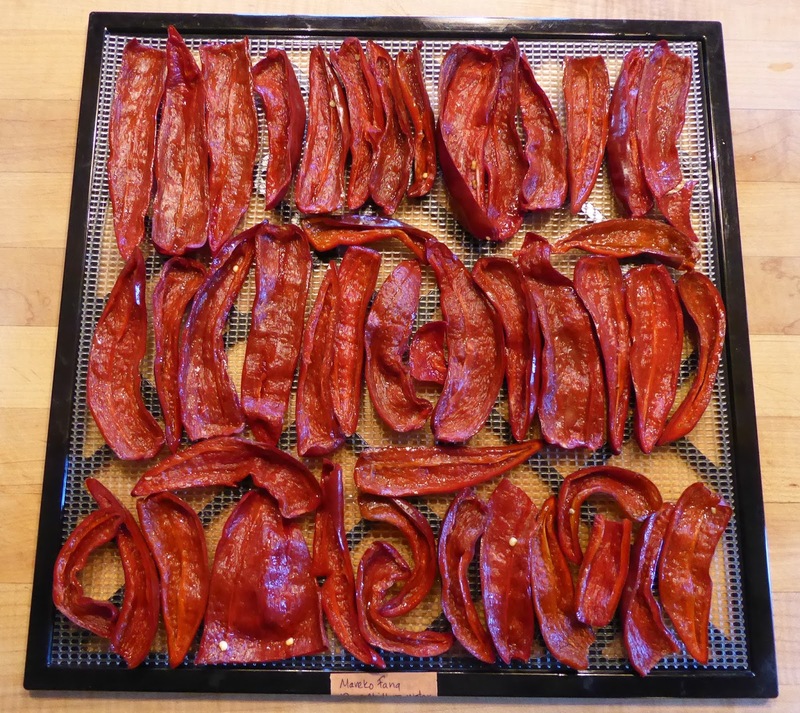 I found that the best thing to do with them is to ferment them with their cores and seeds and then dehydrate them and grind them into flakes. The fermentation and dehydration treatments intensify the flavor and aroma and add some much needed complexity. 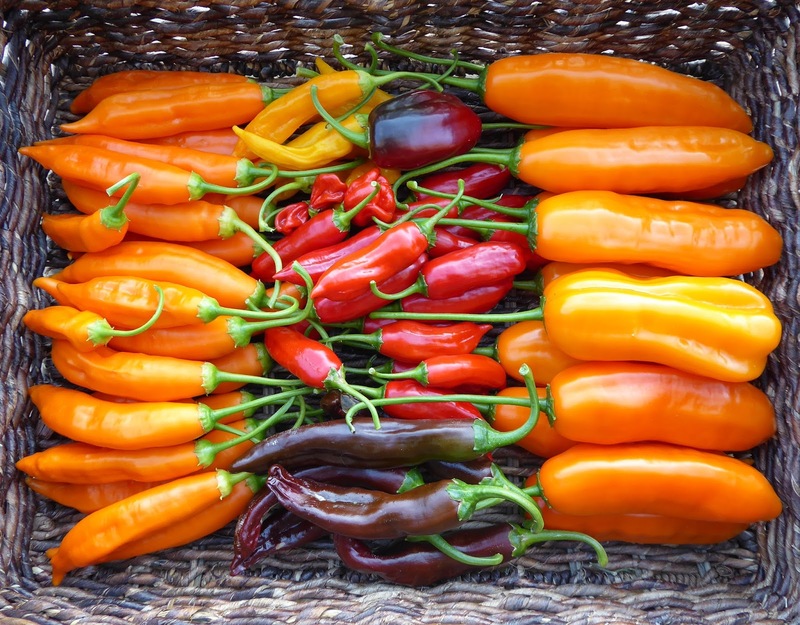 The processed peppers are much better than the raw fresh ones. In spite of the ratty tatty appearance the tomato plants are still producing. Jaune Flamme has been going non-stop and the fruits taste just as good as ever. 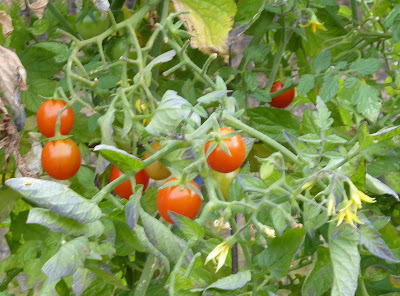 The cherry tomatoes have slowed down quite a bit but they keep producing and a couple of plants are still blooming. Some of the larger fruited tomatoes caught a bit of a second wind and have some green and ripening specimens. 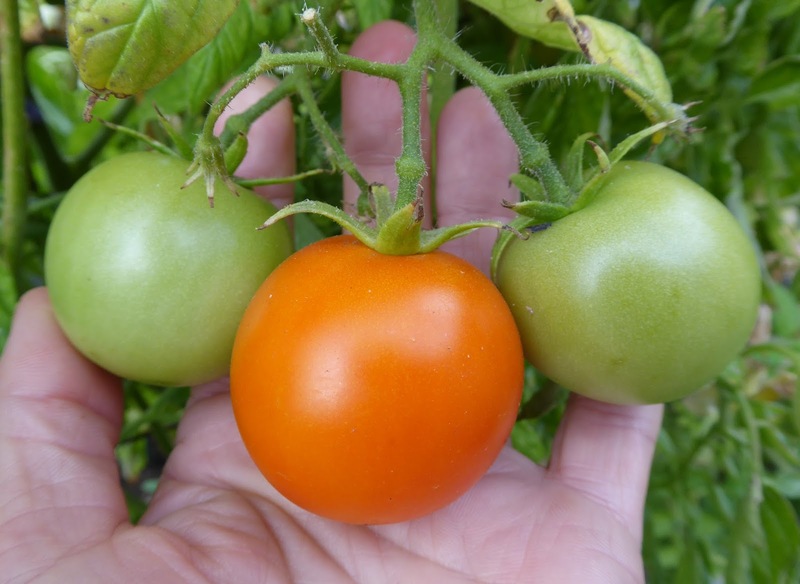 They're not the same as height of season tomatoes but still better than anything at the grocery store. Bed No. 2 is pretty much all new or overwintering plants for early spring harvests. 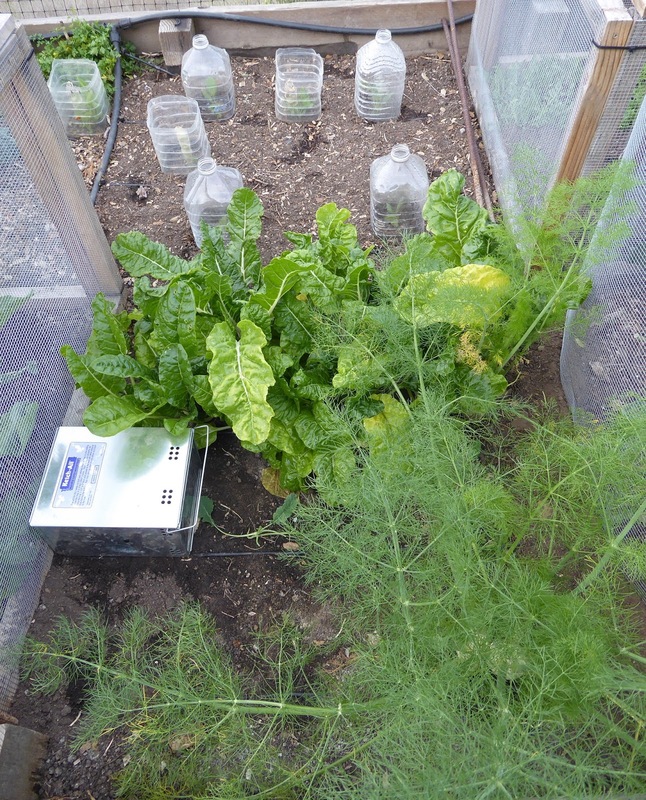 That one little cage there is restraining the Aji Amarillo Grande plant that is left over from 2016. It's a shadow of the huge plant that it became in 2016 but it has some peppers and isn't hogging too much space so it gets to stay for now. The back side of the bed is sprouting water bottle cloches. In the foreground the bottles are protecting tender young seedlings of Batavia broccoli, Pixie cabbage, Little Jade napa cabbage, and Tronchuda Beira. 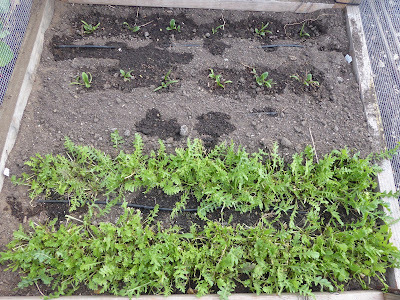 At the far end of the bed I've put in a couple of dozen seedlings of Syrian Medieval chard. I expect them to bolt pretty quickly in the spring and that's just what I want them to do because I want to save their seeds. Inside the cages are a few varieties of winter radishes. 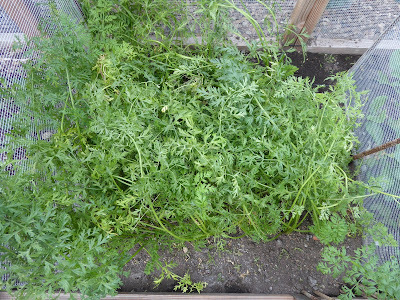 Winter storage type carrots that had some pretty spotty germination. Oh well. 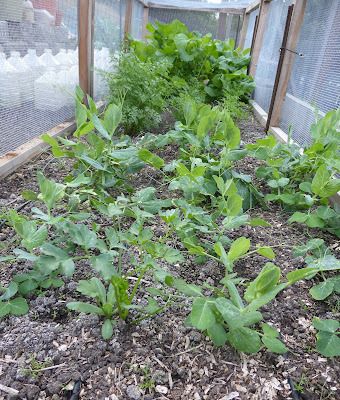 There's overwintering snow and shelling peas that I've been clipping the tender shoots from. Lettuce babies. 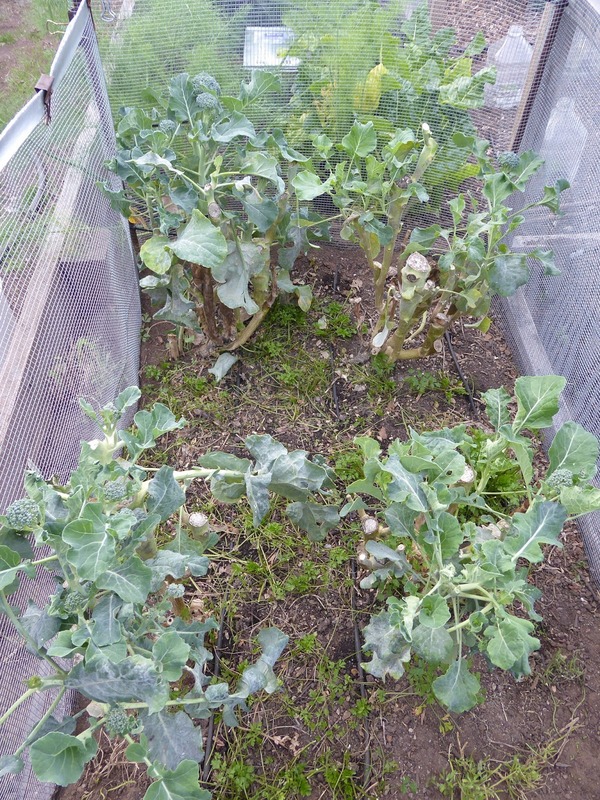 One of the advantages to growing some of these veggies in the cages is that they are easy to cover up if there's a freeze in the forecast. Over in Bed No.3 there are lingering veggies from seasons past, like the much trimmed Batavia broccoli that I set out in the garden on December 7 of 2016. It's difficult to pull it out when it keeps putting out shoots like this one. 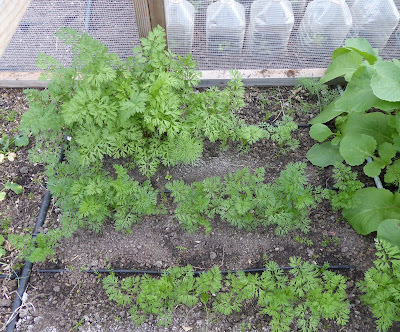 Not long a go there was a nice lush patch of Cilician parsley growing around the base of the broccoli plants. 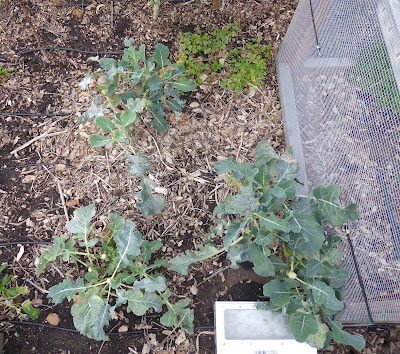 But a vole burrowed its way under the mesh and mowed a lot of it down so I cut the plants back hard. 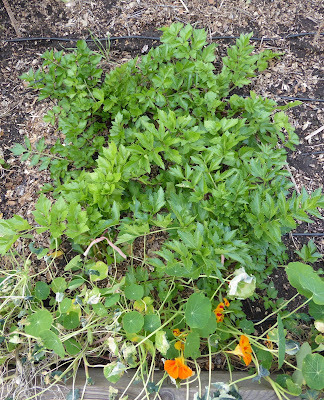 More lingering veggies include a patch of baby chard plants that are trying to grow up. 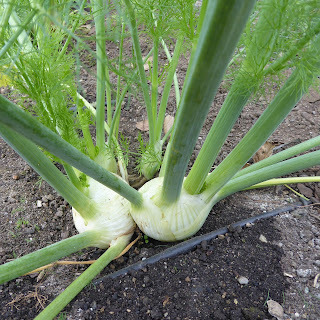 And there's a couple of Orion fennel plants that have regrown a couple of times since I sowed the seeds back in April. 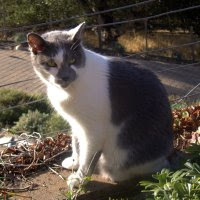 The silver box is a Ketch-All Multiple Catch mouse trap. It's the only trap I've used that has worked for voles. 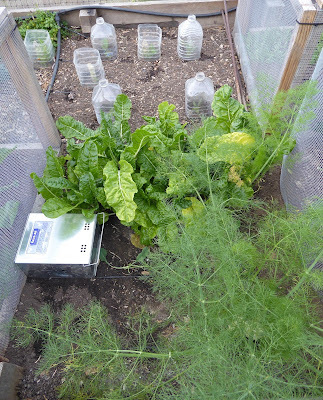 The vole that was working the parsley patch and the veggies in the cage to the left was lured into the trap after I sprayed the garden with hot pepper spray and then placed some tasty untreated greens in the trap. A mouse found its way into the trap at the same time. That's the third round for that Orion fennel plant. 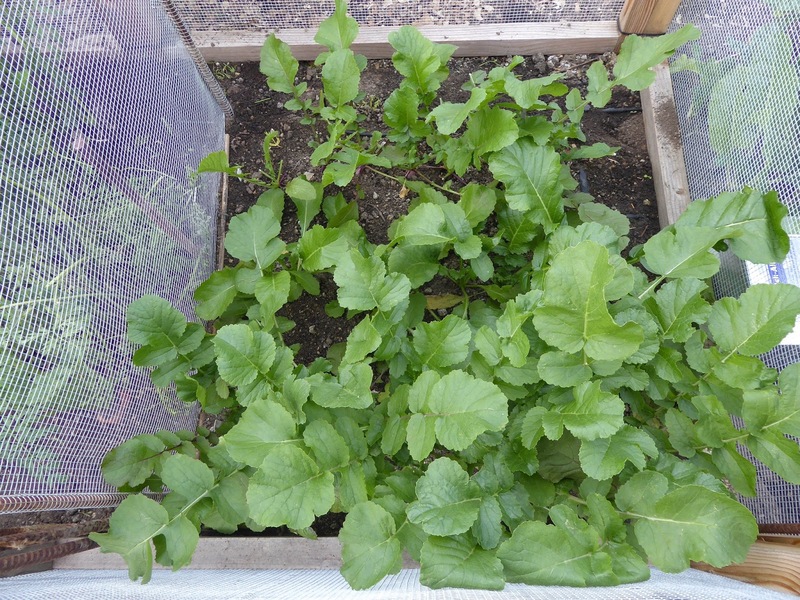 The vole preferred the radishes at the back of the cage. 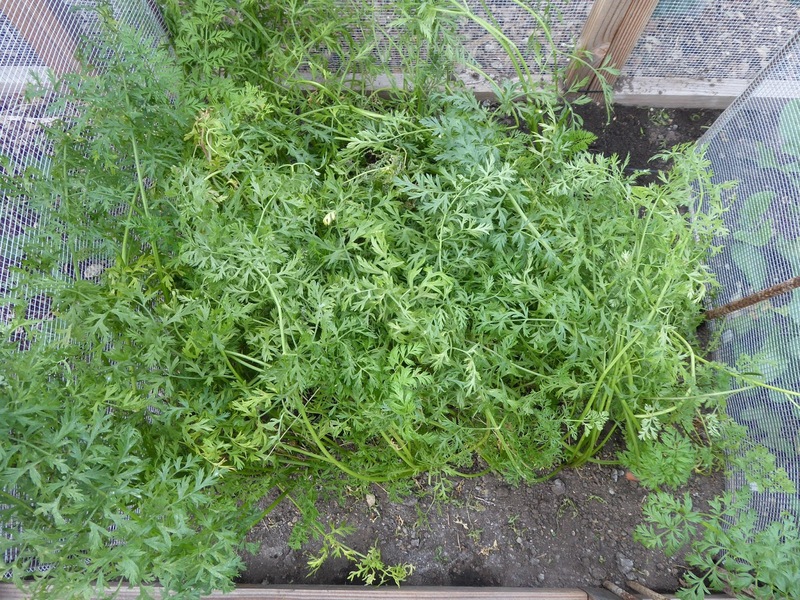 And it decided that carrot tops were quite tasty too. 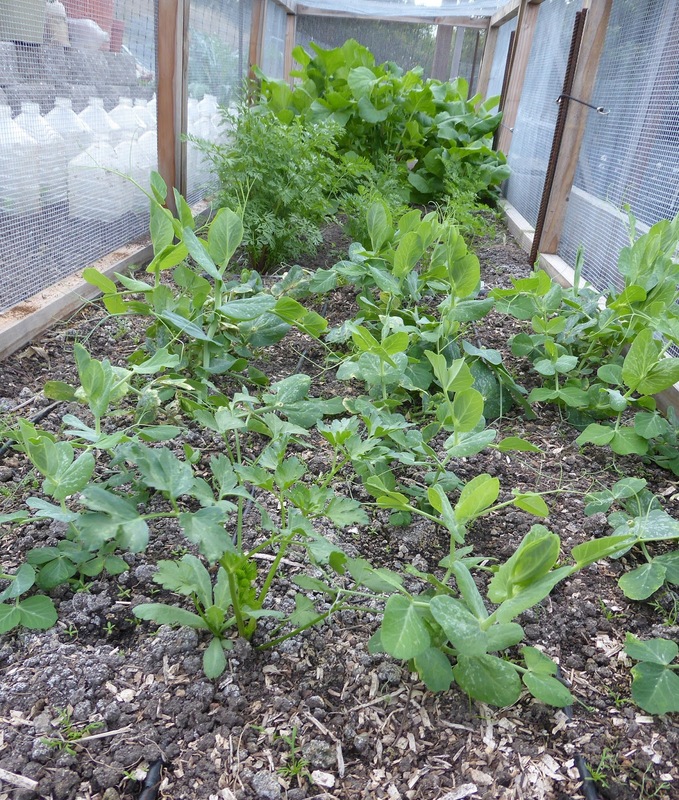 Oh, and pea shoots make a grand meal for a vole. More Batavia broccoli plants. Younger and less productive. 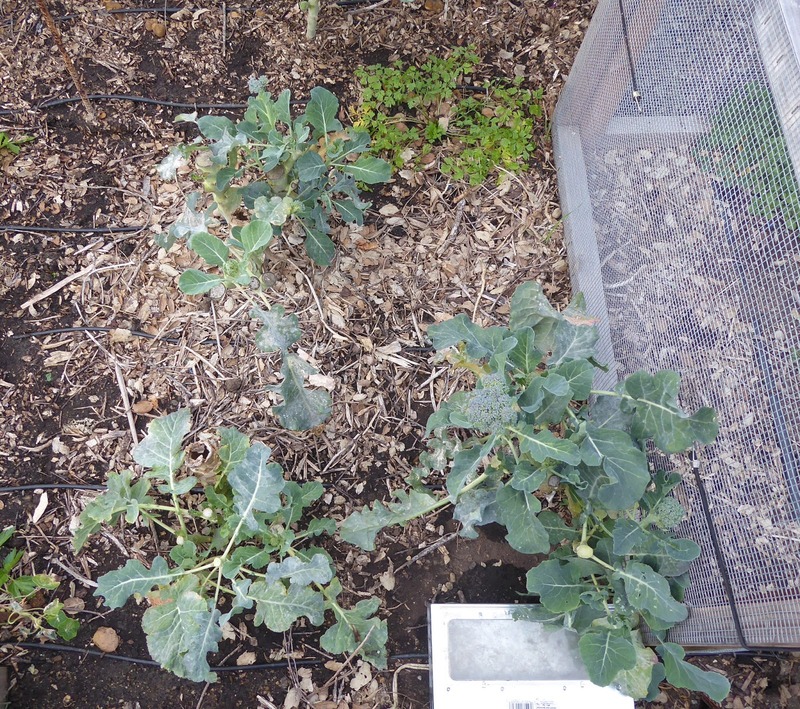 They're slated for removal to the compost bin soon. 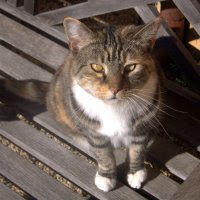 There's another trap, a Pro-Ketch Multiple catch mouse trap. It works great for mice but I've never found a vole in it. Here's one disappointing veggie. 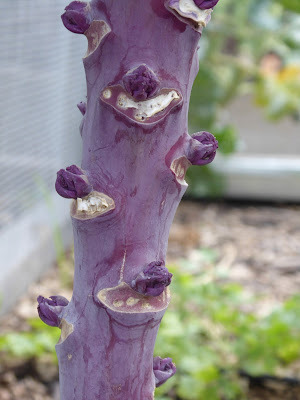 The Pink Plume celery has been runty. 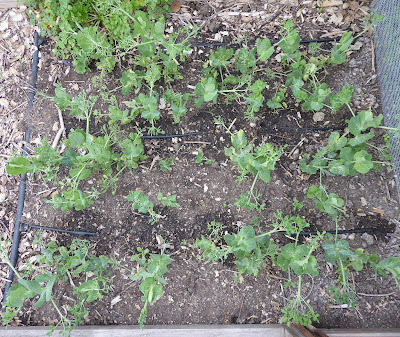 It's probably my fault, I planted them late and they were stressed more than once. I harvest what I can but it takes multiple little tiny stalks to equal one normal sized stalk. And another very disappointing veggie. 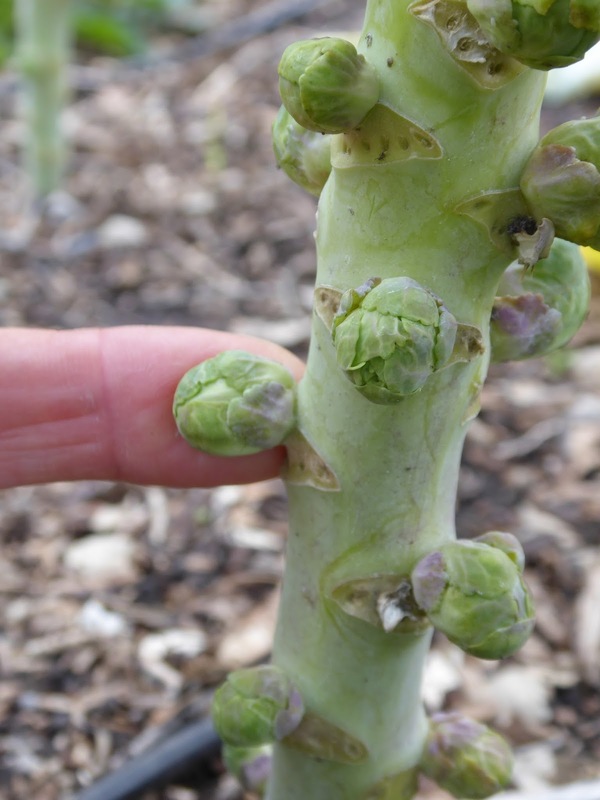 The Brussels Sprouts are runts also. 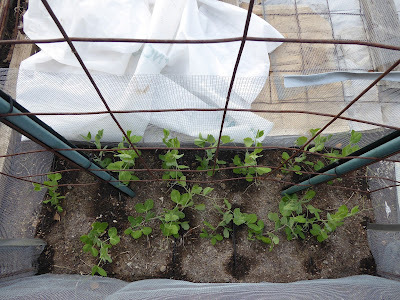 I'm not sure why I haven't ripped them out yet other than that I don't need the space at the moment and it's better to have something growing than to have bare dirt. 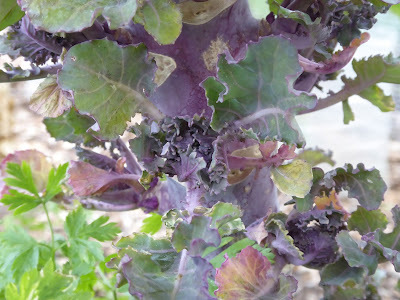 The Kalettes aren't doing much better. I think the problem is that some oak tree roots found their way into that part of the bed and sucked up all the water and nutrients. I severed some oak roots that I found growing in from around the edge of the bed but that hasn't really helped much. There's some sort of fungus that's working on the dead oak roots but it's probably tying up nutrients as it works. This spring I'll have to dig out that end of the bed and make sure that I cut any other intruding roots and add some more root barrier. 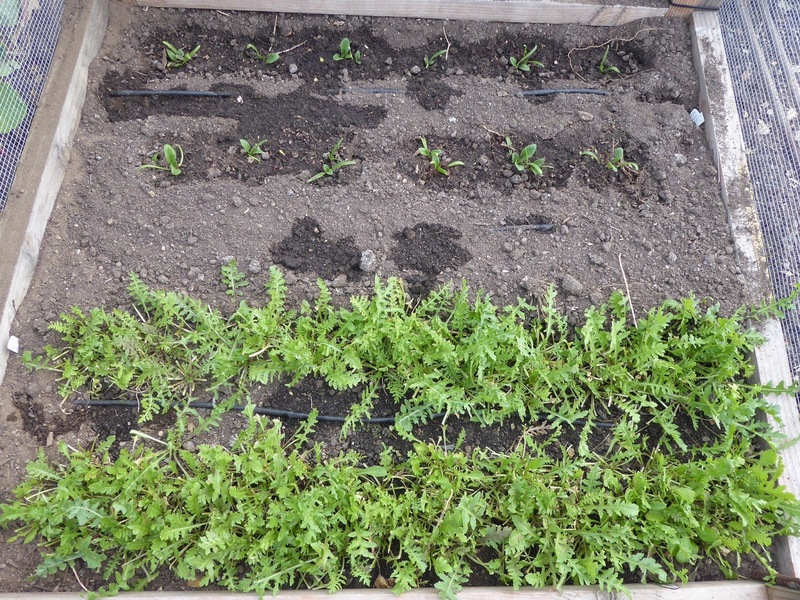 The veggies at the other end of the bed are doing much better. 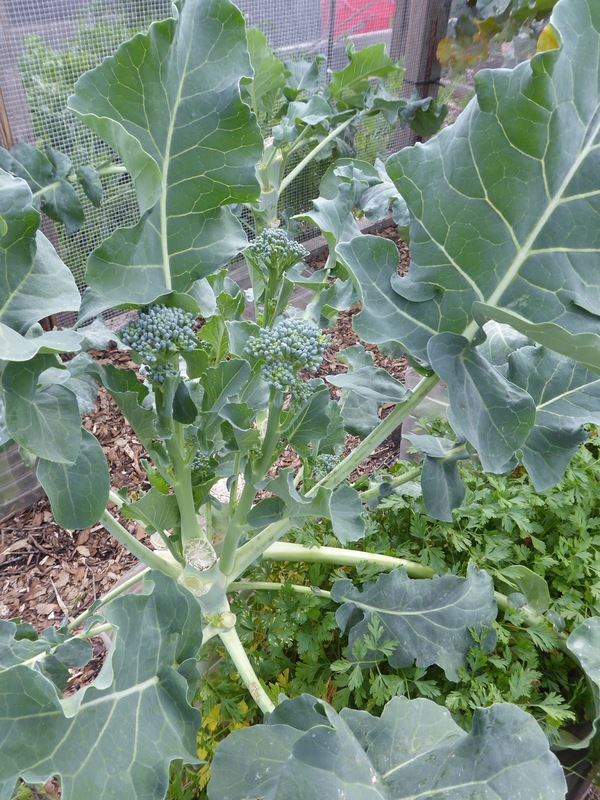 The fall planted Broccolini plants are putting out the third round of shoots. 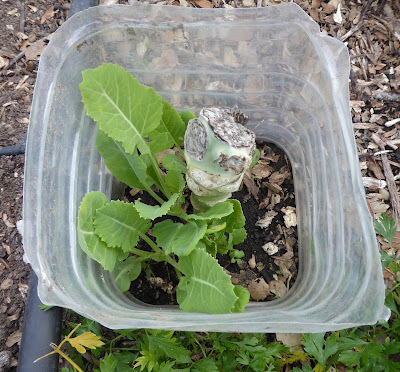 I'm watching a couple of the Fioretto Stick Cauliflower plants that have pushed up some shoots from the base of the plant. This variety doesn't produce side shoots just one main many branched head. 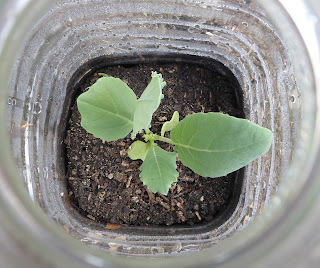 I'm curious to see if the shoots will amount to anything. 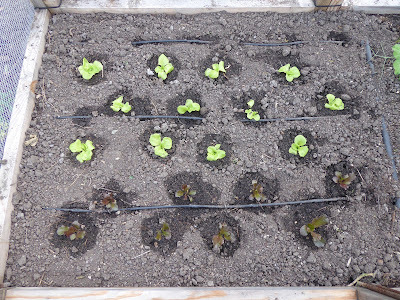 But I'm not counting on those little shoots so I've planted 4 new plants around the old ones. 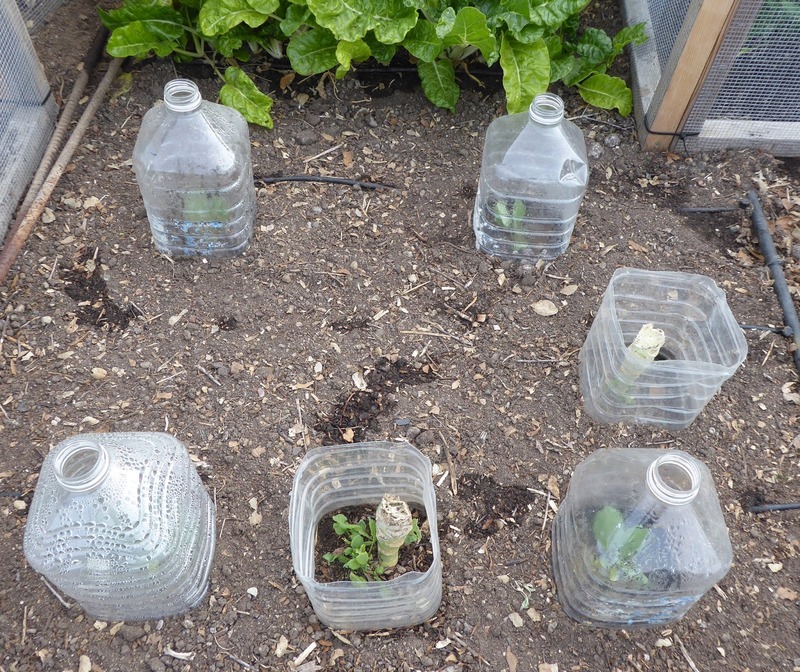 The new seedlings are getting protection from some water bottle cloches. 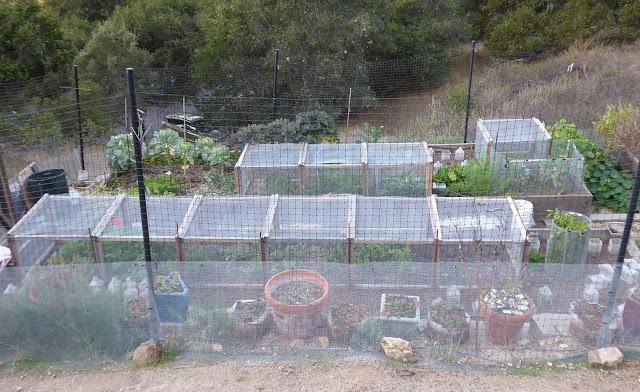 There's a mix of old and new in this cage. 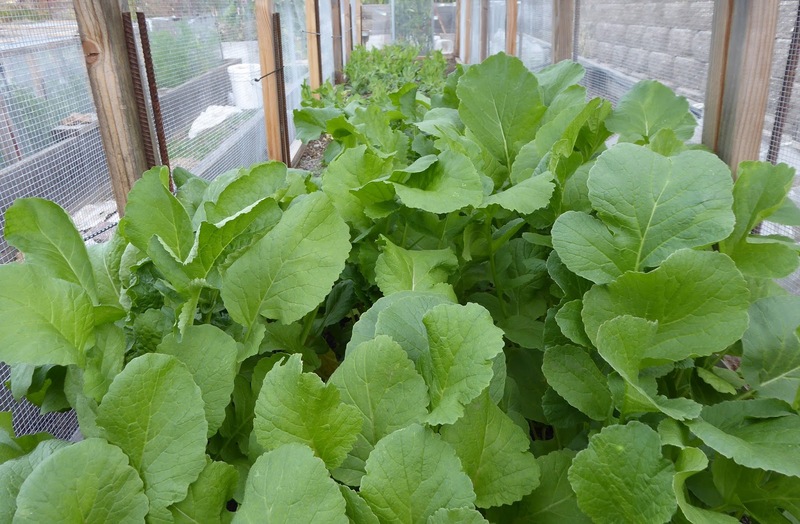 The Speedy arugula has been providing successive harvests since September but the cold short days have put the brakes on and I haven't cut any of it since the end of November. I slipped in some little seedlings of spinach into the back of the cage. 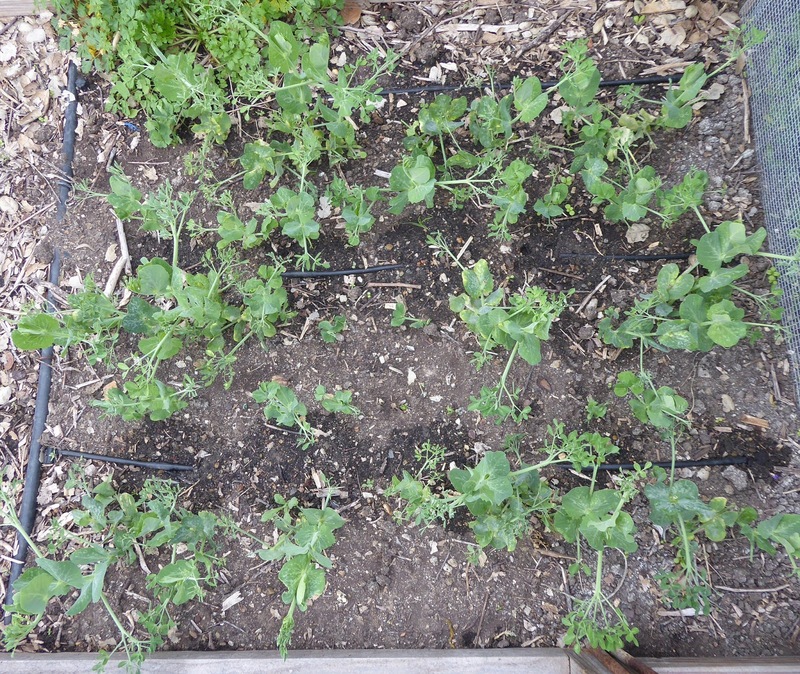 I hope they will provide a harvest or two in a couple of months. 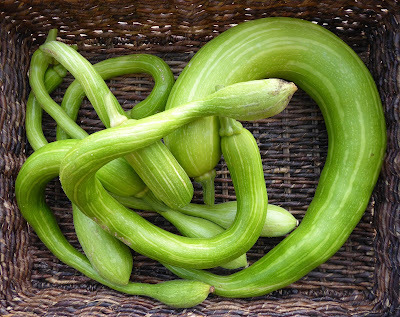 I'll admit, that photo of the Tromba vines is not what they look like now. 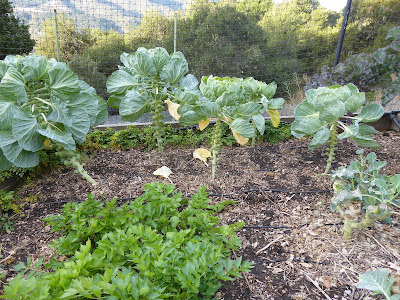 A couple of nights at 30ºF has blasted most of the foliage. But I knew the frost was coming so I gleaned what I could from the vines and I'll be showing that on Monday for my harvest post. 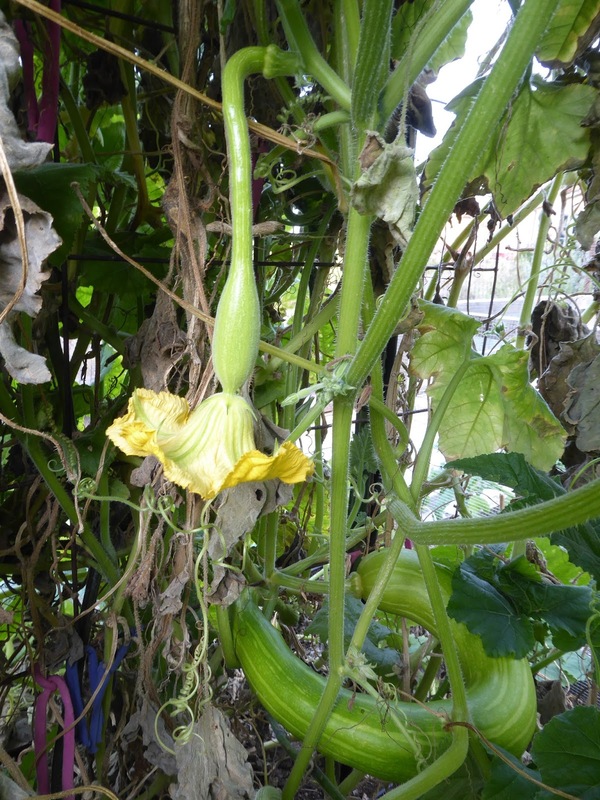 Those squash aren't going into the compost bin. 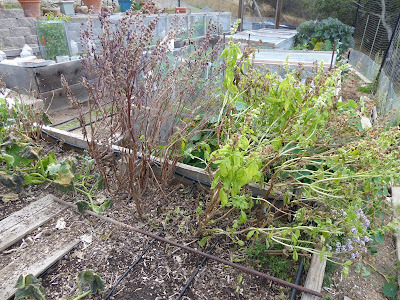 The old basil plants are compost material. 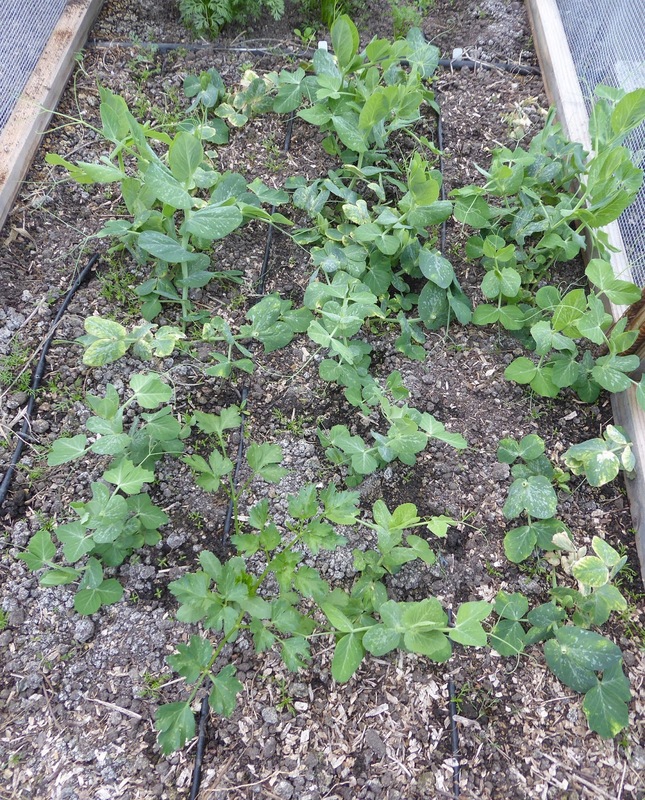 These are a variety of snow pea that are adapted for cold weather. They sailed through the frosty nights with no damage. 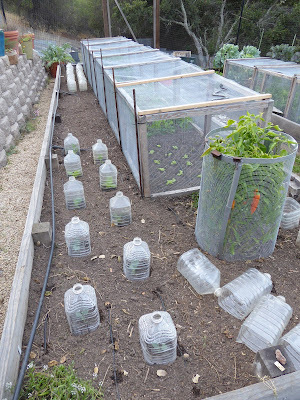 The frost cloth piled next to the cage is for the peppers and tomatoes in the bed on the other side of the path. 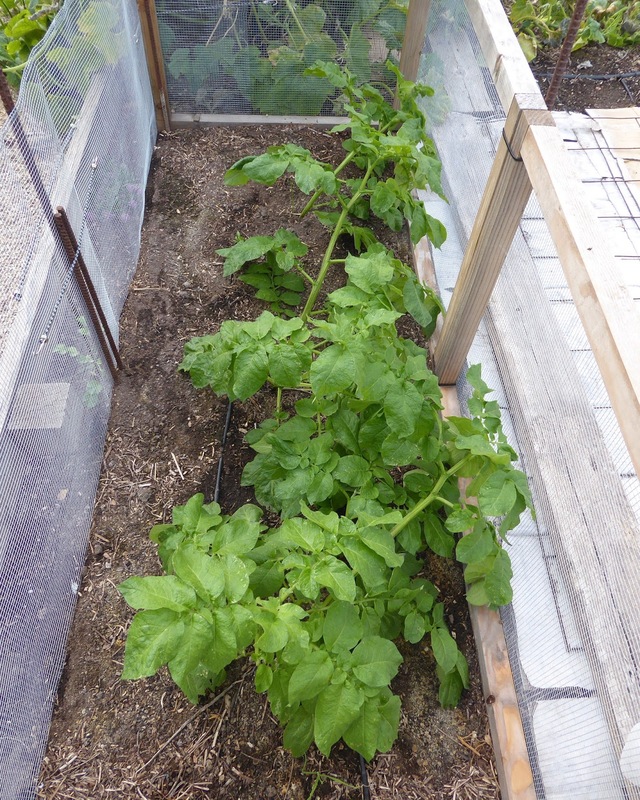 My experimental winter potato plants also made it through the frosty nights with the help of some frost cloth. 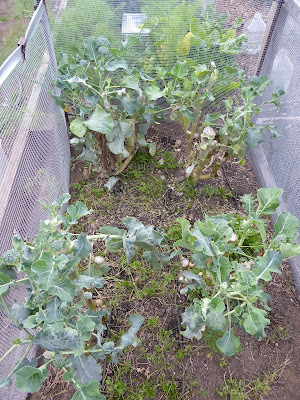 That's the primary reason why they are growing in a cage, it's super easy to throw some frost cloth over it. 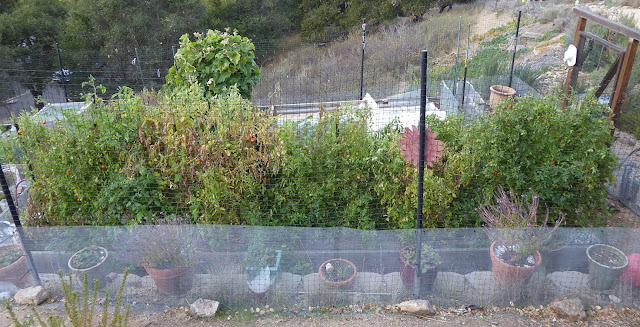 The plant at the far end of the cage is growing mostly in the shade cast by the Tromba vines and that seems to have kept it rather small. So that's just about the latest in my garden. There were a couple of frosty nights since I took all the photos but most of the plants came through fairly well, including the tomatoes and peppers although I did cover up the end of the bed with the Aji's and cherry tomatoes. I'll be back on Monday with another Harvest Monday post which is turning out to be rather non-wintry looking. 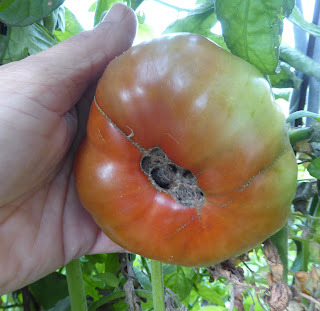 Once again it's time to show off some harvests but I have nothing to show this week. It's not because I didn't harvest anything I just didn't photograph anything. 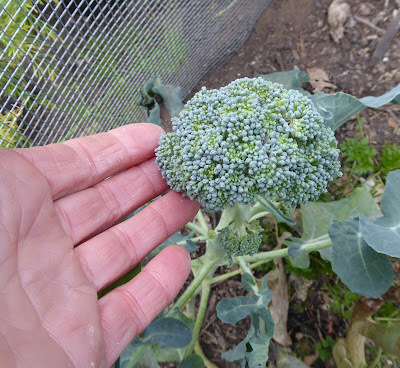 So you'll just have to take my word for it that I harvested broccolini, broccoli, carrots, celery, fennel, pea shoots, and a straggler of a sweet pepper. 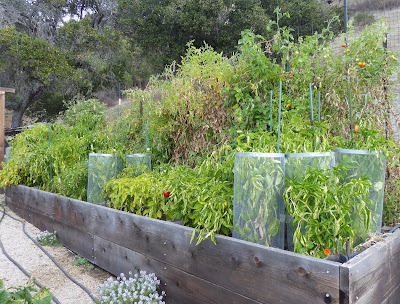 So instead of freshly harvested veggies I'll share a couple of things that I did with previous harvests. Cutting into a big 7 or 8 pound winter squash means that I have to get creative with it if I don't want it to end up in the no-man's-land of the freezer forgotten until I rediscover it encrusted with ice crystals and desiccated from freezer burn. 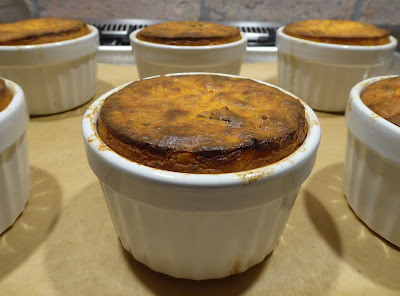 So when I was faced with using up a final quarter of a big Terremoto squash I found a recipe for an Italian Squash Torte which I adapted to make individual ramekins of a savory squash custard, sort of a custard since I can't think of a better description, it's more dense and firm than a traditional custard, maybe more like a savory squash cheesecake. It's a really simple dish of squash cooked down to a puree with butter, garlic, and sage, the squash is combined with ricotta, parmesan, and eggs and then baked. I was really delighted with how it came out so I wrote out the recipe which you can find on my recipe blog HERE. 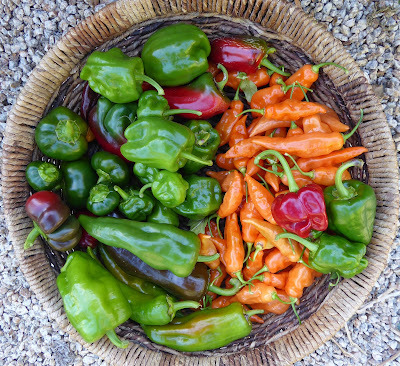 My experiments with fermented peppers are ongoing. 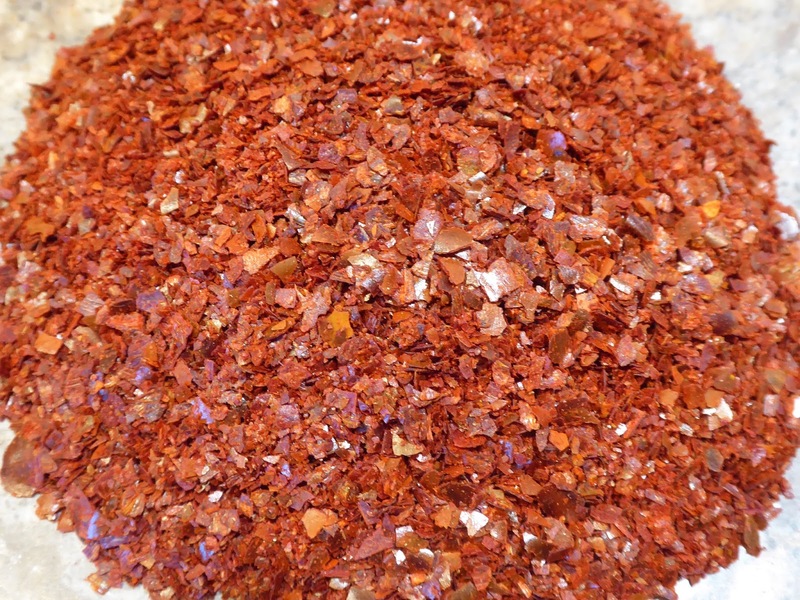 One of my favorite things now is fermented pepper flakes and fermented Mareko Fana peppers have made the best flakes yet. 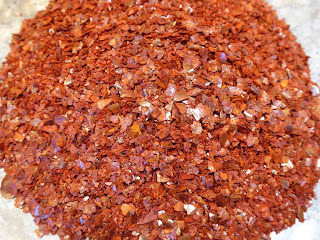 Simply dried Mareko Fana flakes have been my favorite for a couple of years, but I have to say that the fermented version have leapt into first place now. It's hard to describe the wonderful aroma of the fermented version and the extra complexity of flavor. I'm hooked. I don't think I mentioned it before but fermented pepper flakes aren't my idea, I have our Harvest Monday host Dave to thank because he sent me a sample of fermented Aji Golden flakes when he shared some seeds with me. Thank you Dave! Last night I made a dish from a Turkish cookbook (thank you Jane for leading me in that direction) for blackened cauliflower that called for Turkish pepper which I don't have but I substituted the fermented Mareko Fana flakes. The cauliflower is tossed with oil and pepper flakes and roasted until it is tender and slightly blackened and then served atop lemony Greek yogurt and drizzled with a butter sauce that features more pepper flakes and tomato paste. It was quite delicious and I don't think it suffered from not using authentic Turkish pepper.